MANILA, Philippines – The official results for October 2017 Certified Public Accountant (CPA) board exam including the full list of passers, top 10 examinees, top performing schools, performance of schools and related announcements are available at this website as PRC released the results online on November 2, 2017 or ten (10) working days after the last day of board examination. As announced, 4,511 out of 14,816 passed the exams. The schedule of online appointment for issuance of Professional ID and Certificate of Registration will be from November 9-21, 2017. According to the Commission’s Resolution No. 2016-1019 series of 2016 entitled “Schedule of Licensure Examination for Year 2017”, the target release date of October 2017 CPA board exam result will be in eight (8) working days after the last day of board examinations or by October 25, 2017 (Wednesday). However, results may also be released earlier or later without prior notice. Due to the cancellation of government office work this week which resulted in the delay of the processing of PRC work, the new release date of the results of the October 2017 CPA Examinations will be on November 2 or 3, 2017, instead of the previously announced date of October 20/21, 2017. Update as of October 15, 2017: Professional BoA through a Facebook post announced that the results will be released on October 20, 2017 (Friday) or October 21, 2017 (Saturday). Just stay tuned at our social media accounts to keep updated. On the same exams conducted by PRC on October 2016, results were out after eight (8) working days while during May 2017 and May 2016, results were released after five (5) working days. On the most recent CPA licensure exams conducted May 2017, 3,389 out of 9,645 (35.13%) examinees passed. Vianca Pearl Inot Amores and Marianato Jesus Berdin Del Rio, both from University of San Carlos ranked first in the exams having 92.67% rating. USC got the top spot in the top performing school's list having 66 out of 70 examinees passed or 94.29% overall passing rate followed by De La Salle University - Manila having 79 out of 92 examinees passed or 85.87% rating. During October 2016 CPA exams, 5,249 out of 14,390 (36.48%) examinees passed. University of the Philippines (UP) ranked first in the top performing school list having all of its 69 examinees passed or 100% overall passing rate. Vhinson Jay Samson Garcia from Wesleyan University Philippines - Cabanatuan City got the top spot garnering 94.33% rating followed by Daryl John Sarmiento Punzalan from Southern Luzon State University - Lucban having 94.17%. On May 2016 CPA board exam, 2,967 out of 6,925 (42.84%) examinees passed. De La Salle University ranked first in the top performing schools having 54 out of 58 examinees passed or 93.10% overall rating followed by University of Santo Tomas (UST) having 84 out 93 passers or 90.32% and University of San Jose Recoletos having 108 out of 133 board passers or 81.20%. Karim Gonzales Abitago from Universal Colleges of Paranaque topped the exams garnering 92.17% rating. He was followed by Kimjames Sarapanan Manalo from Cor Jesu College having 91.83% and Jayvee Faust Bugtai Anga from University of San Jose Recoletos having 91.67%. 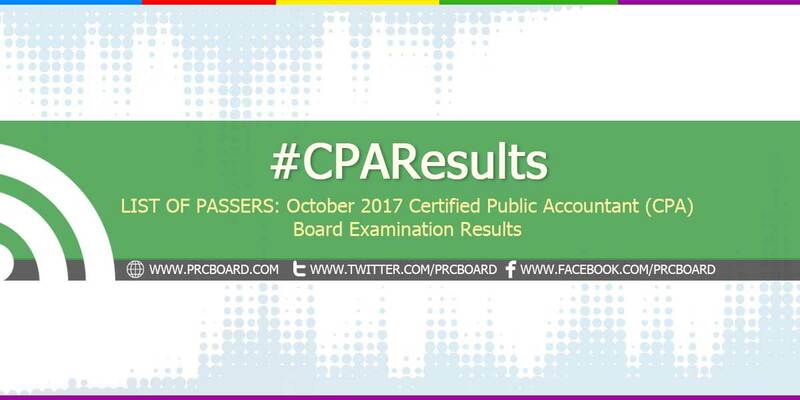 To receive up-to-date news on full results of October 2017 CPA board exam, we advise our visitors to bookmark this page, visit PRC official website or follow us at our social media pages via Facebook and Twitter. Please be guided accordingly on the new target release date of October 2017 CPA board exam results. Wala na po ba itatagal pa yan? I would just like to know why a 2-day cancellation of work resulted in a near 2-week delay for the results. Is there any particular reason? More time for nervousness but also more time for prayers, more time to ask for God's blessing this results day! Keep the faith! Will it be possible to release the results earlier than scheduled? "Thy will be done" Thanks God.I'm claiming it. Christian Rainville U. Valle, CPA October 2017. Go for 100% UP-DILIMAN! :) Goodluck to all examinees! Lagi naman magulat ka kung 20% lang hahaha! Hi Admin. What time po? Your will be done Lord! claim it pareng eyo. .
Wala pdn b un result? Anong time po kaya mai-release? Claiming it since day 1 tapos huhu? To all CPALE takers, no matter what happen, do not give up your dream. Stick to it, because your dream will happen as long as you have the will. Remember that you graduated as BSA for the purpose of being a CPA. Well it is not absolute if you give up and take a different path. But whatever decision you will take after result, accept it positively and carry it over along your next/continued journey and for sure you'll grow just as those who will made it this time. nananu la ne soy? hahaha. goodluck CPAs!! God bless, S.Scurry!! - M.S. Go Lebron James!!!!!! kaya bawi kayo sa standing! Ya allah. I'm claiming it na. what time po ba ang release? Shet Guys!!!!!! Taas ng Passing Rate ngayoN!!!!!!!! 62.42 % GUYS!!!! THANKS SO MUCH SA BLESSIGNS!!!! Totoo ba? Wag kang paasa ha!!!! OMG GUYS RESULTS ARE OUT REFRESH REFRESH!!! THANK GOD!!! ANA MARIE MARGALLO CPA!!!! WOOHH 7th PLACE!!! God bless to every one. Hays mas matagal yung agony nyo kesa nung batch namin :) but worth it naman yan. PAKIPOST NA PO.. DI NA 'KO MAKAPAG-ANTAY.. HIHI..
Good luck takers!! Keep the faith! Keep the FAITH!God is good! Passed or not passed. Your success does not depend on your license. It is just a ticket or gate pass and its all depend on you. Relax and no matter what happen accept it! Wag kayo mabahala sa sasabihin ng iba. And congrats to do those who will pass. Use your license wisely and with integrity. Help people/business and teach them to pay right taxes. woooo! Ma. Teresita B. Gonzaga, CPA! "HOURS TICKING AWAY BEFORE RELEASE OF CPA EXAMINATION RESULTS...."
Just tell us if the results will be out today or tomorrow or the next week or month. Nkaka excite! sana makapasa po lahat ..
CPA NA GF KO YEY! Anong Oras po kaya Yung result? Finish or not finish pass your paper PRC! Kailangan finish baka hindi maisama name mo bahala ka Hahah joke joke(bad joke tho) Goodluck sa inyo! :) Patience is virtue. Pasuspense daw kasi kakatpos lang ng haloween. Good luck, chi!! 😊🎉 go go CPA! GO tiff! CPA na this! Pahinga muna kau. Mamayang madaling araw yan, take a little sleep kasi baka di na kau maktulog lalo mamaya. Hehe, Goodluck!!!! Daming pumasa...14,999 yung pumasa out of 15,000... Good Job! Grabe na ung kaba. Wala pa din bang result? Papasa na yan.. Future kapatid sa propisyon.. Try refreshing it around 9pm, 12midnight, 3am :) that feeling of being nervous but excited at the same time hahah goodluck. Just a few hours more. Pinaasa na ni crush, pinaasa pa ni PRC hahaha. biqti na. matulog na kyo,wyt nyo n lng s newspaper,bili kyo my souviner pa kyo,tapos iframe nyo...hahaha..
Ilabas nyo na po pangalan ko dyaaaaaan! Its killing me softly. Huhuhu! GOD BLESS US ALL! CPA NA TAYO! THANKYOU G! We trust you Lord God. Malapit na po..ready to post na..just refresh and refresh...Good luck CPA's..!! CPA NA TAYO MGA KAPATID! CLAIM IT! my days fell like years waiting for the results. my days feel like years waiting for the results. GO CICians-BSA4❤! GOD BLESS US! Ilang oras pa ba ang hihintayin. May hihintayin pa ba? Go stmc!!! 100% God bless everyone!! !